Fans of Tom Felton are absolutely spoiled – the 21-year-old actor has provided many ways for them to keep virtually in touch with himself. Other than having his own official website, Felton is very actively Tweeting at twitter.com/TomFelton, where he often posts the most random, funniest things and has more than 48,000 followers, and updates his YouTube account whenever he has a new song and video to share at youtube.com/user/feltbeats. He is also well supported by his most comprehensive website on the Internet http://www.feltbeats.com. Feltbeats.com – whose name was taken from the pseudonym Felton uses to release his musical works – is owned by Misha. She has a crew of eight site administrators to run this interactive website. In the beginning, she only planned to talk about Felton’s music, but along with Felton’s increasing Internet popularity, Misha made additions that now allow all Feltonites to catch the latest news on Felton, video and song previews and even exclusive original interviews with Felton. Thanks to the wonderful relationship Misha shares with Felton, it’s guaranteed that Feltbeats.com has plenty of interesting stories to share about this young man who ‘sacrificed’ his natural hair color to give way to Draco Malfoy’s blondness on screen. FiRST’s contributor Amanda talked to Misha about the inner workings of the website in this interview. Amanda: How did Feltbeats.com come about? Misha: The site started almost exactly a year ago (as of May 20). Essentially, I was a bit of a Harry Potter fan – enough that I bought the last two books at midnight when they came out, but not enough that I had any costumes or anything. I came to it late, however – I didn’t start reading the books until the sixth one was about to come out! One day while browsing around the internet I saw a link that said, “Draco singing!” and so of course I checked it out. I watched the YouTube video (“Time isn’t Healing“) with my hands covering my face in shock and maybe a little embarrassment. I expected him to be bad, I’ll be honest. But, after a few minutes, I peaked through my fingers and watched, more appreciative. Then I watched it several times. Then, I ripped the song from the YouTube site and played it over and over on my mp3 player. I was hooked! Absolutely addicted and completely thrilled with the music! So, who are the people behind Feltbeats.com and how long have you all been fans of Tom Felton? I really felt that I needed more news and interaction on the site. So I went around on all the various Tom Felton sites, and found the best, most well-spoken, more hard-core Tom Felton fans out there. These were the true Feltonites who posted everything first, who knew everything about Tom, who had been fans of Tom since he was a kid (unlike myself, who had only been a fan for a year or so and hadn’t even seen The Borrowers or Anna and the King – still haven’t, ack!). I invited them to become admins, and all of them accepted! I think adding them as admins was one of my best ideas yet, because that meant our site instantly had the latest news, and the forum lit up with interactivity as admins themselves started chatting about Tom. Later we added two more admins who were really knowledgeable and active (there are now eight of them), and this is the administration team we have at feltbeats.com today. What can Feltbeats.com offer the fans? Firstly, Feltbeats.com is a great place to hang out and chat about Tom Felton, his music and Harry Potter. The atmosphere is really light and casual, and in general we’re a witty, easy-going gang. I can’t pinpoint it exactly, but it seems Tom Felton fans have similar personalities and we all click together – no matter how old someone is, no matter where someone lives in the world – we all get along great! We also cover Tom news to an obsessive, ridiculous degree. We will post just about any news item, just about any photo (except personal photos – we won’t post those unless we have Tom’s permission). Now that we are in contact with Tom personally, he or his management team give us lots of news about his activities – which has really made us an authoritative source for news about him. Additionally, we’ve been able to ask for his input on various subjects (such as the recent rumor that he had been cast as Riley in the third installment of the Twilight series, “Eclipse“), which of course gives us a lot to post about. In the long run, what is your main goal with this website and how will Feltbeats.com work in terms of supporting Tom Felton? When the site first began, the goal was really to have a positive, pro-Tom site where people could get lots of Feltbeats music news. Nowadays, we’re much more focused on helping spread the news about Tom – in terms of both his music and his acting. We’ve even started the “Feltbeats Army” – which is essentially a marketing street team of hundreds of fans around the world who go on little missions to promote Tom and his projects. I would love it if more directors and producers in the industry came to understand what a huge star Tom Felton is – he has a HUGE fanbase that is dedicate, loyal and WORLD WIDE. Just by casting Tom in their movie, they gain a ton of exposure for their project and instantly have thousands and thousands of people around the world interested in it. Plus Tom is a great guy and a great actor – so it’s a win-win! Feltbeats.com seems to have a good relationship with Tom Felton. What is the key to this wonderful relationship you share and what advise would you give fans when it comes to interacting with Tom? We do have a good relationship, and I think it is mostly because Tom trusts us to act in his best interests. When the site was first founded, I always told the admins (and anyone else on our forums) that we want a positive, professional site so that if one day Tom Felton himself stumbled upon it, he wouldn’t be disgusted by what he saw. Apparently, it worked – he did visit the site and he liked it enough to respond to an e-mail I wrote him… the rest is history. As for advice for other fans, I do have some! Firstly, the best way to interact with Tom is to follow him on Twitter (http://twitter.com/tomfelton). That IS really him, and he does read his replies and often responds to them! When sending him tweets on Twitter, be classy. Don’t send 500 tweets a day asking for a reply from him or something like that. Just respond casually about things he might be interested in, or things he’s talking about. And definitely be funny! Tom has an amazing sense of humor and he really appreciates witty remarks and clever jokes! Tom has told me that his favorite part of Twitter is seeing all the crazy responses he gets when asking a question. Lastly, be patient. Though he does read all of his replies, be aware that he gets THOUSANDS of replies every day, and can’t respond to them all! So just keep tweeting, and keep being funny, and he’ll appreciate it! Thanks, Misha, for being a dedicated Felton supporter and for this interview. Felton isn’t the only who’s a Twitter regular. Other Potter stars are also Tweeting! Sidney is my mx5 roadster. (car) I know it’s a little silly naming my car but never mind. Interview by Amanda Aayusya, with the assistance of Misha (Feltbeats.com). Speaking of traveling, have you been to Asia lately? If yes, where and how did you like that place? If no, where do you want to go to? I haven’t been to Asia lately but I would love come back and see it all again! As for where I would want to go, I would do anything right now to be back in Hawaii! I absolutely loved Maui, I’m so keen to do a film out there! I’d also like to visit Fiji one day! Have you had any experience meeting fans from Asia? If yes, what was the experience like? If no, then that’s too bad, but we hope you’ll get that experience soon. Not in any official way, but I look forward to meeting them soon! It would be great if we had a premiere out there and I got to go and meet all of them. I’d love to visit Singapore soon also – it is on my next list of places to visit! Switching topics now, I cannot even begin to tell you how delighted I was when you released your first video on YouTube. Your music is nothing short of brilliant, so compliments on that. But it felt like something that came out of the blue — many fans didn’t even know you were THAT musically inclined up until that moment. Just how serious were you about your music back then? Thank you for your comments! I appreciate that! Music has always a passion and it has just developed over the years! I love to play music with my friend as a hobby and to just see the creativity that can come from all of us just jamming together and having fun. We all learn from each other and we all help each other progress our skills. And how serious are you about your music now? I don’t take it too seriously, I just have a passion for music and being creative with it. Thanks to your music on iTunes and YouTube, your Twitter, and online interviews in Feltbeats.com, you’re now somewhat of an Internet phenomenon. How do you feel about your Internet fame? I greatly appreciate all the support and interest from the fans. My fans are incredible! They are extremely inspiring and interacting with them via Twitter is such fun. Its amazing how you can be in touch with such a diverse group of people from all over the world. I love hearing all their responses and thoughts on my music! I take it all in to account I assure you! I am completely flattered by their interest in my music. I know this question has been asked before, but just checking again: do you prefer acting or singing? Which of these two would you like to pursue as a career after Harry Potter? Acting definitely as a career, but I will always write music as I love being creative. If you do pursue acting, after Harry Potter, what kind of movies or characters would you like to play? Action or war movies would be fantastic to do, or even a film related to music. My ultimate character to play would definitely be James Bond. According to reports, you rode an ostrich in South Africa. I couldn’t help but be amused when I first heard about it. Do tell us all about this because it’s not like every day we see a celebrity riding an ostrich. It was great fun, but it was also terribly scary! I fell off which was actually quite hilarious! I’d highly recommend riding an ostrich! Now, just for fun, if you were a wizard about to be Sorted in Hogwarts, which House do you think you – Tom Felton – would be in? I, Tom Felton, would definitely be in Slytherin! And if you could pick an occupation in the wizarding world, what would you be doing for a living? Now pick your preference out of two options given. Don’t think too much about the question. Just answer with the first thing you’ve an impulse to say. First of all, Hermione Granger or Luna Lovegood? Acoustic guitar or electric guitar? Lastly, do you have any messages for your fans in Indonesia and Asia? Thank you for your support! I can’t wait for you to all see the film and I hope you enjoy it! Thank you, Tom, for this lovely interview. 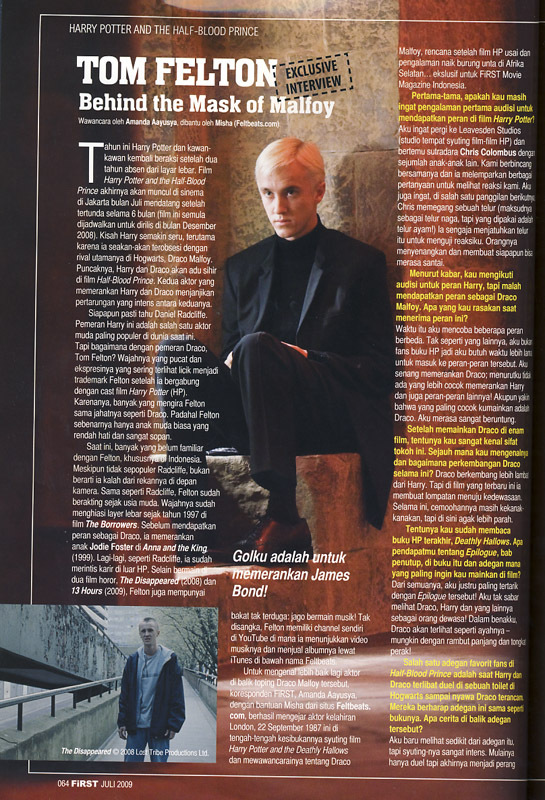 Credits and disclaimers: This interview was conducted with Tom Felton via e-mail exclusively for FiRST Movie Magazine Indonesia, issue 18, July 2009. Copying or using the whole interview without permission is strictly prohibited. Pages scanned from FiRST Movie Magazine Indonesia and are not for commercial use. Images used in the article are copyrighted by Warner Bros., Lost Tribe Productions Ltd., and ITV. Do not hotlink and/or use without permission. FiRST thanks Misha of Feltbeats.com for her help in this interview. First of all, let’s take a trip down memory lane. What do you remember from your audition for the Harry Potter movies? What did you have to do? I remember going up to Leavesden Studios and meeting Chris Columbus with loads of other kids. He used to just talk to us and throw questions to see how we react. I remember in one of the early call backs we were running lines and he was holding an egg (supposed to be a dragon’s egg but represented by a chicken’s!). He then deliberately dropped the egg to see how I reacted! He was great fun and made you feel very at ease. In the past, you mentioned that you tried for the role of Harry Potter, but got the role of Draco Malfoy instead. There must be some kind of emotion involved in that. How did you feel about getting the role of Draco Malfoy? At the time of going for the different parts, unlike most I wasn’t already a fan of the books so it took me a while to establish the different characters. I am so happy with playing Draco and also think Harry Potter couldn’t have been cast better, or the rest of the cast for that fact! Personally though, if I could play any character it would be Draco! So I consider myself very lucky! I was interested with something you said in a recent interview with Feltbeats.com; that you felt like Draco was your character. After playing Draco in six HP movies, just how well do you know Draco? How has Draco’s character evolved since the beginning? Draco has evolved a little slower than young Potter, but in the latest film he really takes a leap into manhood. His early years consisted of mostly childish name calling, but in the latest film he really steps it up a gear. He is slowly becoming a man. Although this might sound like a silly question, but I’ll ask it anyway. Have you read Book 7 in its entirety? What did you think of the Epilogue: 19 Years Later in the book? Harry, Ron, Hermione and even Draco have their own families. How do you imagine Draco’s life 19 years after the end of the story? Of all the scenes, this is the one I look forward to filming the most! I can’t wait to see Draco, Harry (etc.) as men! I think Draco will look very much like his father – probably with a long ponytail and a silver cane! One of my favorite scenes in the Half-Blood Prince book is the scene where Harry and Draco were involved in an ‘accidental’ duel in the bathroom and Draco was badly injured thanks to the Sectumsempra spell. A lot of fans liked that scene and consider it iconic and we hope that it isn’t changed in the movie. Will the fans be disappointed with that scene in the upcoming movie? I’ve only seen bits of it but I know that filming it was intense! What starts as a duel turns into a full-on wand fight! I can’t say too much but it’s very intense. There’s years of tension between Harry and Draco and it is certainly released in the fight – expect an epic ruck! What was it like to film that scene with Daniel Radcliffe? As far as the fans can tell, there are no hard feelings between the actors who play Harry and Draco, so how did you and Daniel summon the intense emotions needed for that scene? Dan’s great – ever a professional and great fun to work with! It’s funny that one minute we’re talking about a who should be in the England cricket team then 5 minutes later we’re trying to rip each other’s heads off in a bathroom. I think we bounce off each other’s energy, making it much easier to get the scenes as intense as they should be… and no hard feelings! We have a great relationship on and off screen, and I can definitely see myself working with him again in the future. In the movies, you get to play as Jason Isaac’s and Helen McRory’s son, as well as Helena Bonham Carter’s nephew. Is it intimidating to be around them? Or do you feel comfortable around them, as if they’re your own family? It is amazing to have these great English actors around you! Very intimidating at first but they are very nice and made me feel at ease very quickly. They are all great fun to work with, especially Helena Bonham Carter. Let’s take another trip down memory lane. Your first movie was The Borrowers, which was recently shown in one of the cable channels in Indonesia. Do you remember anything from there? Jim Broadbent and Mark Williams, who are playing in Harry Potter, were in it as well. Did they recognize you on the set of Harry Potter? Mark and Jim both remembered me and it was great to see them again – they are both extremely talented guys! I had a great time filming The Borrowers and it was a fantastic first film to do. Afterwards, you played in Anna and the King. The story of this movie happens in the country we now call Thailand. Did you have to travel to South East Asia to film that movie? If yes, where did you go to and what do you remember from this experience? For the movie, I went to Malaysia with my mum for 4 months. I was so young I unfortunately don’t remember much of it though! This year Harry Potter and his brave band of Gryffindors return to the big screens after a two year absence. Harry Potter and the Half-Blood Prince will finally appear on cinemas in Jakarta in July after it was postponed for about half a year (it had originally been slated to open in cinemas in December 2008). Harry’s tale is more thrilling this time around, as he becomes obsessed with his schoolyard rival Draco Malfoy after suspecting him of evildoing. Harry and Draco will eventually face off in a battle of spells in Half-Blood Prince. Both actors who play these characters on-screen promise an intense epic battle between the two students of opposing Houses. Everyone knows who Daniel Radcliffe is. The young man who’s been playing Potter for nearly a decade is one of the world’s most popular actors at this moment. But how about the one who plays Draco, Tom Felton? His pale face and sly, smirking expressions are Felton’s trademarks ever since he joined the Potter cast. Thanks to this, there have been more than a few people who are under the impression that Felton is as bad as Draco. Well, they’d be surprised to know that Felton is a down-to-earth, courteous young man and is not at all like his on-screen alter ego. It’s a pity that, at this moment, Felton has not yet gained the massive popularity that Radcliffe enjoys in Indonesia. That is not to say, however, that he’s inferior to Radcliffe in front of the cameras. Just like his co-star, Felton has been acting since a young age. His face has graced the big screens since 1997, debuting in The Borrowers. And before becoming Draco, he played Jodie Foster‘s son in Anna and the King (1999). Again, very much like Radcliffe, Felton has also begun building his career for when the Potter saga wraps up. In the past year or so, he has been in two horror flicks, The Disappeared (2008) dan 13 Hours (2009). But, more excitingly, last year Felton has revealed one of his greatest, most unexpected talents: music. Felton has all the makings of a true aspiring indie musician: a catchy name that he uses for his solo act, Feltbeats; an account in YouTube, where he releases his videos and showcases his prowess in singing and songwriting; being listed at iTunes, where fans could purchase his albums. We look forward to bigger, greater things from this particular endeavor of his. Credits and disclaimers: This article was written for FiRST Movie Magazine Indonesia, issue 18, July 2009. Pages scanned from FiRST Movie Magazine Indonesia and are not for commercial use. Images are copyrighted by Warner Bros. Indonesia. Do not hotlink and/or use without permission. Lord Voldemort may be Harry’s archenemy, but Harry’s true rival is this arrogant blond-haired Slytherin: Draco Malfoy. Son of Lucius and Narcissa Malfoy and heir to the powerful Malfoy family, Draco is everything that Harry is not. He still has both of his parents living whereas Harry is an orphan; his family is wealthy in that old money kind of way whereas Harry’s relatives are vulgarly nouveau riche; he is a sneaky Slytherin whereas Harry is daring Gryffindor; he is light-haired whereas Harry is dark. In short, they have very little in common and, since the very beginning of this wondrous tale by J. K. Rowling, Draco has been as a persistent thorn on Harry’s side. In the first year, he offered his hand for an alliance with Harry. He was, of course, rejected, thanks to his pompous attitude and his snickering comment made on Harry’s new friend, Ron. Needless to say, from that moment onward, that they were both doomed to a relationship of mutual dislike and enduring rivalry. Draco’s ultimate goal is to undermine everything Harry has accomplished at Hogwarts. After Harry had been made Seeker in the Gryffindor Quidditch team, Draco weaseled his way in the Slytherin team in their second year, playing the same position Harry played. He attempted to get Harry’s friend Hagrid, who had been appointed as a teacher in their third year, fired and, while that didn’t work, he successfully sentenced Hagrid’s pet, a hipogriff named Buckbeak, to death. Their fourth year saw Draco betting against Harry and taking Diggory’s side in the Triwizard Tournament. And finally, in their fifth year, Draco joined Dolores Umbridge’s Inquisitor Squad and took part in unraveling Harry’s effort to teach proper Defense against the Dark Arts to his friends. There is no doubt that Draco strove to make Harry’s life one big living hell. It’s safe to say, though, that Draco’s villainy has never truly presented any real danger for Harry so far. His nastiness, with all the pranks and the taunts, is the kind that every growing teenager have indulged in at one point in life. Come the sixth movie, however, Draco loses his status as comic relief and is now cast in a more serious light. Draco becomes more than Harry’s schoolyard rival in Half-Blood Prince. Both older, though perhaps not wiser, both develop a new intensity in their rivalry that is previously unmatched, because the game that Draco now plays is not mere sports; he is playing a game of life and death, a game that whether directly or indirectly affects Harry’s life. He is the catalyst that sets the wheels moving, initiating the chain of events that lead to the real war between Harry and Lord Voldemort. With these changes in Draco, so does Harry change as well. Rivals they might forever be but from this point onward, their destinies are intertwined. There is no character in the Harry Potter saga more mysterious than this Potions professor with the dark beady eyes, inky blank hair and somber expression. Severus Snape is so mysterious that even the actor playing him in the Harry Potter movies, Alan Rickman, does not particularly relish discussing the character in interviews. Understandable; considering that his role in the movies so far has also been kept to a minimum. 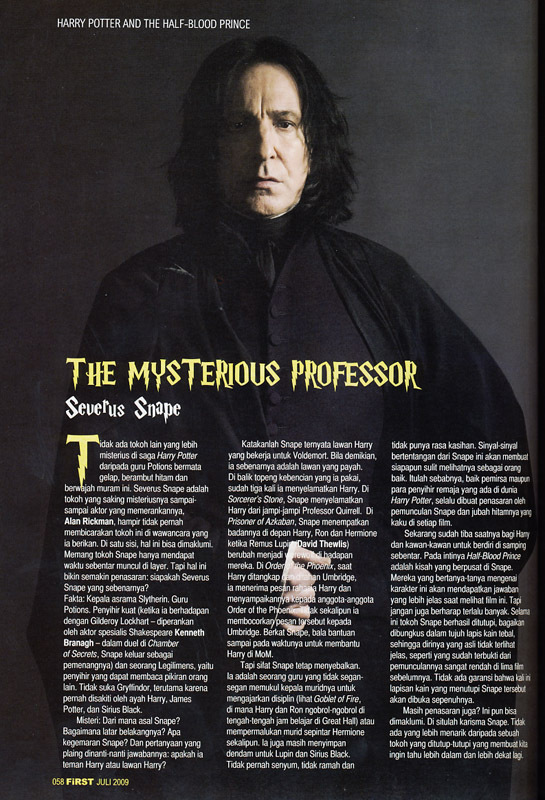 But also intriguing, because… really, who is Severus Snape? Facts: He’s the Slytherin Head of House and Potions master at Hogwarts. He’s a strong wizard (Snape faced off with Kenneth Branagh’s Gilderoy Lockhart in simulate duel in the second movie and came out triumphant). He is a Legilimens, a wizard who is apt at reading other wizards’ minds with a spell. He’s not very friendly with the Gryffindors and likes to pick on them, thanks to an old grudge that was born from having been bullied by Harry’s father James and godfather Sirius in their youth. Myteries: Where does he come from? What are his hobbies? Who does he like? And, most importantly, who does his allegiance lie? Is he Harry’s friend or Harry’s foe? If he is a foe, then he doesn’t make a bad enemy for Harry… not really. For all that hatred he seems to radiate for his former tormentor’s son, he has so far saved Harry’s life three times. In The Sorcerer’s Stone, he rescued Harry from a possible curse sent to his way while playing Quidditch by the duplicitous Professor Quirrell. In Prisoner of Azkaban, Snape used his body to shield Harry, Ron and Hermione when his colleague, Professor Remus Lupin (David Thewlis), transformed into a werewolf. In Order of the Phoenix, he managed to decipher Harry’s ‘coded message’ and later on alerted the Order of the Death Eater threat at the Ministry. Subsequently, the rescue squad arrived on time to save Harry & Co. in the epic battle at the Ministry. But he’s just not a very nice person at all. He’s the kind that wouldn’t think twice to smack his students on the head for insolence and disobedience (see: Goblet of Fire, scene at the Great Hall, where Harry and Ron talked among themselves during study hour). That’s why the mixed signals coming out from Snape jam our perception of him and we are kept on the edge of our seat every time the distinguished Rickman shows up on screen in his austere black robes to torment the heroic teen wizards. Now, the teen wizards will simply have to step aside for a while, because Half-Blood Prince is essentially Snape’s story. Those who are curious about this character will be able to catch a deeper glimpse on this man who perpetually stands on the grey area of the saga. But be forewarned – you probably won’t see that much of him in the end. The filmmakers have succeeded in cleverly cloaking Snape’s character in multiple layers of guise in five movies by keeping his screen appearances low. There’s no guarantee that all of Snape will be unveiled in the sixth Potter installment, and yet… we can’t help but be excited about what’s coming next. That is the beauty of Snape, after all. Nothing piques the curiosity more than the mysterious man on the background and leaves us wanting for more. The time may not have come yet for Harry to be able to fight Voldemort on his own. Harry’s not even half as proficient in magic as this evil tyrant. Lord Voldemort is undeniably strong – stronger than any other wizard alive in their time, except for Dumbledore – and he is cunning. He is the Slytherin. A descendant of Salazar Slytherin himself, one of the four founders of Hogwarts, he upholds Slytherin’s main ideology obsessively: the only wizards that matter, the only magical folk that should be allowed to exist, are those with pure blood. Ironically, Voldemort is far from having ‘pure wizarding blood’. He revealed himself to be the result of a union between a witch and a Muggle man. He resents his father’s blood that runs inside his body and seeks to become greater and more powerful than any other magical being. So ambitious was he that he turned to Dark Magic and aimed to conquer Death. Thanks to his ambitions, he went through various transformations until his physique is thoroughly altered. Voldemort is the only character whose appearance was never the same in every Potter movie until he finally became corporeal in the fourth movie. The first time we laid eyes on him, he was a parasitic tumor on the back of Professor Quirrell’s head. 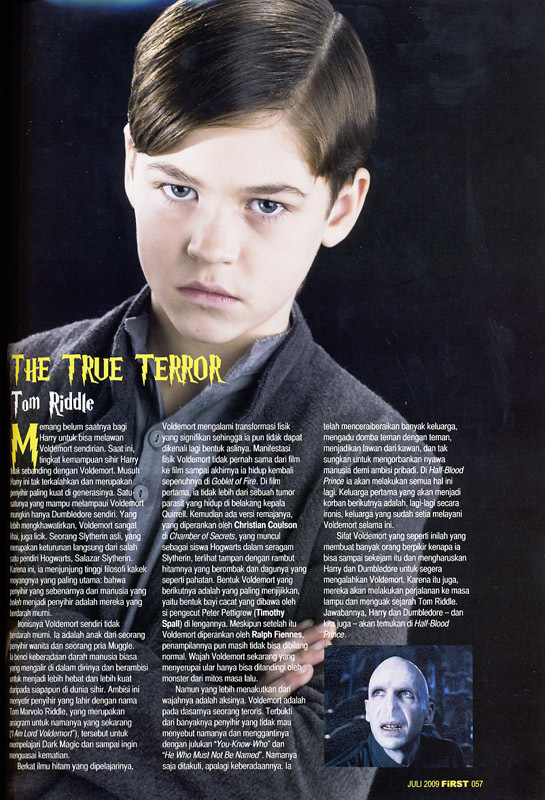 Then there was his youthful version, whose real name was Tom Marvolo Riddle (which provided the anagram for the name he uses to terrorize the wizarding world, “I am Lord Voldemort”), a handsome Hogwarts prefect with slick wavy black hair and nicely squared jaws. His disgusting shape in Goblet of Fire that resembled a deformed, overgrown infant being carried on the arms of Peter Pettigrew was the penultimate form he had before being revived into his current body. And despite having an actor as fine as Ralph Fiennes in his robes on screen, Voldemort is still not very desirable either even now. After all, he does have the face of a snake, with red orbs for eyes and slits for nose. There are very few mythical creatures that can surpass the creepiness of this man’s countenance. Even more terrifying than his looks, however, is his operation. Voldemort is basically a terrorist. Just from the way people refuse to say his name, referring him to as “You-Know-Who” and “He Who Must Not Be Named”, is an indication of how fearful his influence is, let alone his actual presence. He has torn families apart, pit friends against friends, made enemies out of allies, and not hesitated to sacrifice human life for the sake of his ambition before. And he will continue to do so again. One family, in particular, is about to become his next victim. As irony continues to lace this villain’s existence, that family is none other than the one who has served him loyally thus far. That kind of makes you think, doesn’t it? About what sort of man he really is. About where he came from. About what is it that turned him this way. Harry and Dumbledore are thinking about that, too. That’s why we can expect Voldemort’s enemies to try harder to delve into his past. The answers, they will find in Half-Blood Prince.